Finally, A Solution to the Avdat Problem? The poignant simplicity of the avdat baptistry makes it one of the more compelling design choices for that part of the church. Patterned and so called after a font discovered in the fourth century North Church at Avdat, this type of font takes the form of a cruciform basin cut into the floor. 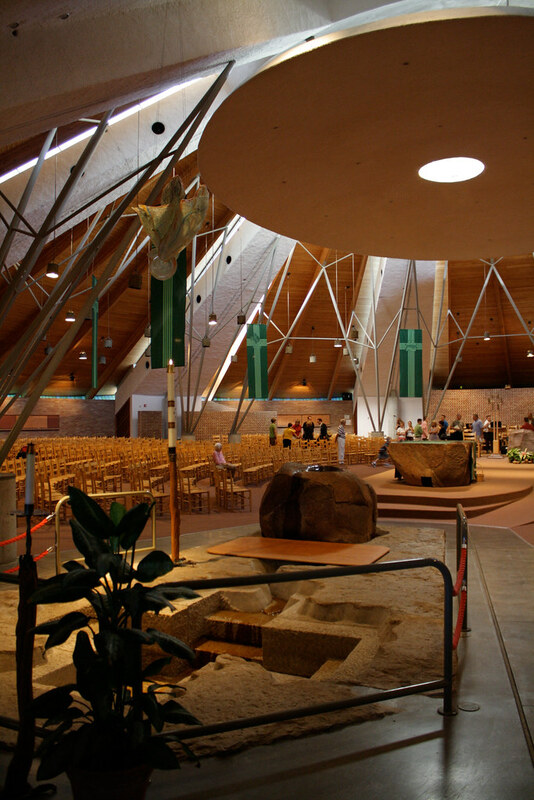 Steps generally occupy the east/west arms of the cross accommodating adult baptism by immersion. 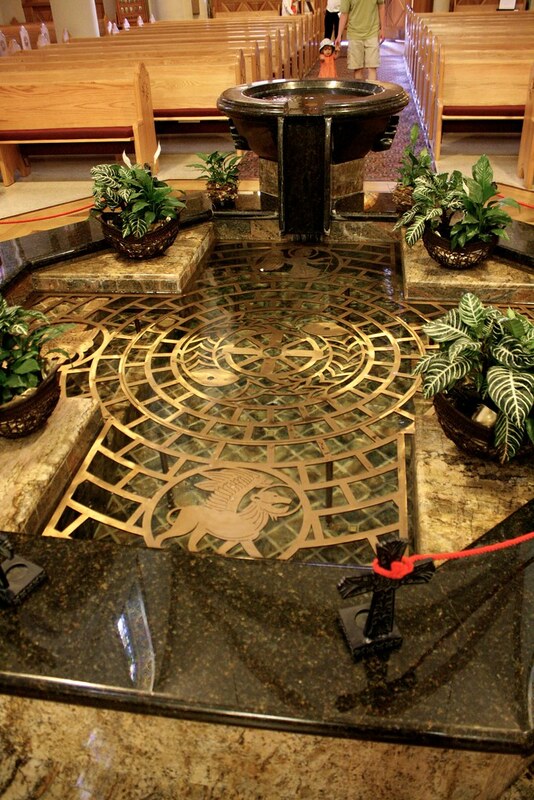 This type of font readily incorporates an integrated affusion basin, most modern examples of which include an overflow feature satisfying any requirement for running water in the baptistry. It also conveys the image of death and rebirth particularly well. Nothing says "tomb" and "death" like a hole cut directly in the ground into which one must descend. Prince of Peace, Plano, designed by Gary Cunningham, features this rustic sculptural version which ties in beautifully with the rough hewn altar and ambo of the same stone. The attached affusion basin is likewise sculpted from an adjacent boulder which overflows into the font. The stone ensemble is the work of Brad J Goldberg. 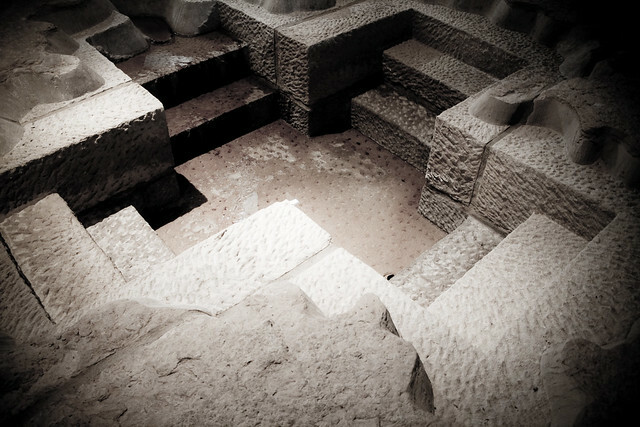 The Avdat font then meets all of the liturgical and symbolic requirements of a baptistry while providing a way to avoid the common pitfalls of immersion fonts: looking like a bathtub or hot tub, requiring climbing over a wall for entry (negating the image of descending/dying), reducing visibility to the rite in a raised basin, etc. Though certainly not appropriate for every application, particularly when space is limited, the avdat is worth consideration for new construction. Building codes do not favor three foot pits with no railings, particularly when filled with water. Take a look at the Prince of Peace, Plano again without the dramatic cropping. This problem seems insurmountable; any attempt to provide fall protection cancels out the simplicity or the symbolism of the form, if not both. A railing will have more visual weight than the font, especially from a distance. And railings are incredible difficult to make integral. Any successful gate will still be a gate, a visual barrier. Elevating the font the necessary amount makes a wonderful fountain (most of the examples of this solution I have seen also include a sign asking visitors not to throw coins in the font), and the phenomenological gap between fountain and baptismal is already tenuous. Raising the walls also brings us back to the "hot tub" associations, which are even less desirable. The temporary, crowd-control barriers at Plano are a particularly disappointing type of railing. There are even worse solutions as well. My own current church - St Albert the Great, Austin - has a nice local stone and mosaic avdat font at floor level in a dedicated baptistry beneath its tower. The solution here, however, is an unsightly cover of unfinished plywood. 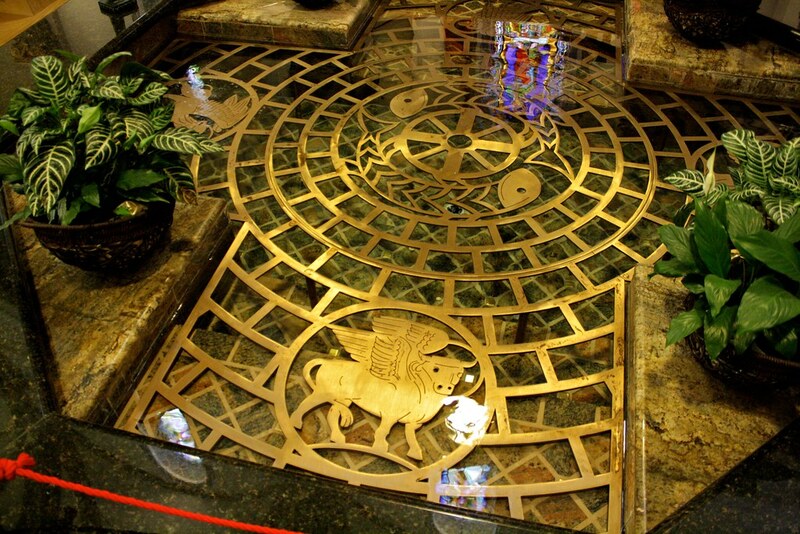 Most people would not be aware that the baptistry is beneath, and the empty font below makes creates what is essentially a giant drum to be played by the children who love to run across it during mass. The plywood also interferes with the water overflowing the affusion basin, so the entire ensemble remains dry except when in direct use. So when visiting the St Francis Basilica Cathedral, Santa Fe, my first reaction to the recently added avdat font in the center of the nave was, "this is the best solution I have seen to the avdat problem yet." On second thought, it is the only solution to the avdat problem I have seen. The edge of the font is still raised slightly, and might be more effective were it made still lower, but the primary safety feature is an elegant bronze(?) grate just below the water's surface. The brilliance here is placing it below the surface of the water. Were it above, the experience would be much more of a barrier or separation from the water. But just below, the metal enhances the water rather than impeding it. The play of light from the two surfaces, the motion from the overflowing basin, and the reflections of the stained glass combine to create a beautifully dynamic font. This, combined with the figural carving of the grate, makes me wonder if the average viewer would think of it as a necessity of safety or as just another furnishing of the church.